SU 30 is a capable plane and to underestimate it would be foolish. The JF 17 would be a good answer in a defensive pattern. The JF 17 and Mig 29 share the same type of engine (RD 93 and RD33 have only minor differences). The range of both Mig 29 and JF 17 is expected to be similar. On balance it is likely that JF-17 will end up as a point defence and medium range fighter. ( like the Mig 21/ F7 planes being used by the Paf now). Its unlikely that it will ever be used as a strike role because of its short range and less capability to carry ordinance . ( A similar sized F-16 can carry approx. double the weight than a JF17 and the F16 has double the range). As the PAF doctrine for the forseeable future will be denial of airspace to the enemy, its lkely to do the job. ie. dont expect the JF-17 to bomb enemy (IAF) airfields !! If its supported by good avionics, radar and tactics ( ie defensive with good AWACS backup), its likely to give all IAF aircraft ( including SU 30 mki, Mirage and Mig 29) a run for their money! Meteor on Chinese/Chinese co-developed aircraft? Expect Britain to veto any integration of the Meteor on the JF-17 or J-10. The Chinese incidently have their own LRAAM project. Once in service, that's the one likely to be inducted in the PAF. I was refering to Meteor being bought as a weapons package with a purchased aircraft in this case the Europian +1 option PAF said it would excercise/buy,we have to see how MRCA goes, what is selected and how advance it is only then we would know how PAF would react to the indian purchase and what would be considered or what options will be excercised to counter it. Yes what you said is true given that if the Missle alone would be bought the sale wont come through. The Russian managed to reduce the RCS of the MKI to about 3sqm using RAM and composites I've heard. Any reference? Or just wishful thinking? There's no say on Su-30 with a RCS being lower than 15m2. Russians are working on reduced RCS of new Su-35BM for sure. The canards are also removed from the new model. Su-30MKI is underpowered (low thrust-to-weight ratio 0.77 while Jf-17 is 0.96 and EF 1.2), with drawbacks of a large RCS and not-so-powerful weapons. Any fighter with good radar and BVR capability has a chance to put up a fight against MKI. Su-30MKI is underpowered (low thrust-to-weight ratio 0.77 while Jf-17 is 0.96 and EF 1.2), with drawbacks of a large RCS and not-so-powerful weapons. Any fighters with good radar and BVR capability has a chance to put up a fight against MKI. That is what one should do. I am using Pak figures.Indian figures speak a different story. The PAF both in 65 and 71, had US aircraft and possibly the best dogfighters. The IAF had mostly Gnats, Mysteres, and Su-7s.The Hunter was not even supersonic!!! Only in 71 did the IAF get Migs. Yet in both wars, the IAF outflew the PAF in missions carried out. In 71 in fact, the PAF was absolutely shutdown by the IAF, with over thrice the nos of missions carried out. The IAF flew far more missions and deeper into Pak, than The PAF could. Now how do you shoot down the greater no of aircraft when the enemy is flying lesser missions and is tucked away somewhere, and is mainly defending its territory and not on offensive missions. Also thanks to the US , both in 65 and 71, the PAF had far better Radars, electronics, air defence thanks to the US. Even then and while flying against a Monkey airforce,the Paf rarely made any difference to any indian ground operation, while in 71 the IAF wiped out Pak armour in the desert in the western sector. Today the story is very very different, with the IAF and the Indian Navy having far advanced capabilities.Thee Monkeys, dont know, apes maybe yes! I said compare the kill record. really, how u have known so much about IAF? But comments from USAF, French AF, RAF, Singaporean AF, Russian AF are difference. History tells the truth, I suggest you look at Pakistan-Indian air kill records, they will show how IAF pilots compare. Su-35BM will be the last developed Flanker. An final upgrade, final variant. Actually, the designation is quite confusing, since Su-35 already exists in Russian Air Force. Su-35 was the export designation for upgraded Su-27, called Su-27M, internal Sukhoi designation T-10M. Su-27M gave baseline Flanker new avionics, as well as precision air-to-ground capability. Only five of these are in service with VVS (Russian Air Force), with 237th regiment based at Kubinka Air Base. VVS chose another path instead; to incorporate technologies tested in Su-35/T-10M, together with those of Su-30MK, into an standard upgrade project for the baseline Flanker, the Su-27SM. The Su-35 designation was also used for Su-37, dubbed as “Terminator”. Aircraft was a testbed for 2D thrust-vectoring engines, mounted on Su-35/T-10M. The new Su-35BM is going to fill the interim gap between standard 4+ generation Su-27SM in service today, and PAK-FA, 5th generation fighter in developement stage. Thus, Su-35BM is designated as 4++ generation fighter, together with new MiG-35. Official first flight will commence late this year, Sukhoi officialy stated that year 2007 is the ending year of all work on Su-35BM. After MAKS 2007, Su-35BM will be put on state trials. The aircraft should be ordered by VVS, after all, they’re the ones who supported the initial beggining of work on the BM, after successful Su-27SM program. The most important Su-35BM/T-10BM characteristics are : supreme flight performance (superagility), long range information targeting systems, jam-proof datalinks for squadron or ground control operations, high performance short, medium and long range missiles of both anti-air and anti-ground type, carried externally on fourteen hardpoints, sophisticated EW/ECM/ER systems, radar cross-section reduction, high-power sensors with adequate computing power and sensory fusion technique, cockpit with large LCD multi-function displays, and an in-flight refuelling probe.Unlike Su-37, which was seen as remarkable aircraft by aerospace community, Su-35BM will have all Russian systems. Su-37 had it’s cockpit systems imported from French Sextant/Thales. Su-35BM is more alike standard Su-27S, than Su-35/T-10M. It has no canards, has smaller fins, tailcone is smaller than those found on T-10M. High-lift surfaces are larger, big flaperons occupying complete wing trailing edge. Airframe structure is more “refined”, with usage of RAM coating and new all-composites material. Latter is said to grant 20% of weight reduction and an RCS signature suppression. Su-35BM also has larger air intakes. Engines that were planned for T-10BM are Saturn AL-41F1, with supercruise capability, rated at 15 metric tons of thrust each. This family of engines will power PAK-FA too, and are going to power Su-34 Fullback long range strike aircraft. The AL-41 series was built to feed power-hungry aircraft such as MiG’s MFI (1.42/1.44), and S-37/Su-47 Berkut. It was stated that first versions of these engines powered the MFI, but, recent statements from NPO Saturn pointed out, that engines won’t be ready for the first preproduction versions of PAK-FA. Thus, it’s viable to concur that Su-35BM won’t have it’s first flight with AL-41F1. To note : the MFI has flown on AL-31’s, while the Berkut was fitted with D-30F-6 engines, powerplant from MiG-31. However, NPO Saturn managed to develop heavily upgraded AL-31F engines, and designated them AL-41F1A, or article 117S. The designation of AL-41(X) notes that thrust is closer to projected AL-41F series, but the AL-41F1A’s feature old, refubrished core. The AL-41F’s will have all-new core. AL-41F1A are equipeed with three-dimensional thrust vectoring nozzles, too, so both of Russian 4++ generation aircraft will be 3D TVC capable, if we count the fact that Morskaya Osa engines can be upgraded with all-axis nozzles. As it’s stated on official sites, AL-41F1A’s have 14.5 tons of thrust each, that means 29 tons of thrust for Su-35BM. Since some early sources claimed that airframe material enhancement reduced Su-35BM weight by 20%, aircraft could have an greatly increased thrust-to-weight ratio, ensuring superb combat and flight performance. Main radar system for the Su-35BM is the Tikhomirov NIIP Irbis-E (N035E). While it’s pointed out that this will be the radar model used on Su-35BM, it’s also probable that Su-35BM could fly with Phazotron NIIR radar, the Sokol III (N031 Zhuk-MSFE). Given the latest achievements on the field of AESA technology by Phazotron, that are already visible in form of complete systems found on the other Russian 4++ gen aircraft, MiG-35, Su-35BM could be equipped with an derivative of current Phazotron AESA models. However, Irbis is marked as the number one option for the radar system. Tikhomirov NIIP Irbis-E radar uses electronically scanned array (ESA). It’s a multifunctional radar system, working in X-band, holded on two-axis hydraulic drive. Radar uses EKVS-E BTsVM Solo35 computing system. The Irbis-E can track 30 different targets, while retaining continous airspace scan, eg. track-while-scan mode. The fire control system can simultaneously guide two semi-active radar guided missiles. If used in conjuction with active radar guided missiles, this number is eight. In air to surface operations, radar is capable of mapping land and sea targets, and detection of targets in real-beam, Doppler, and SAR modes. Four ground targets can be tracked at the same time, while two can be attacked at the same time, too. Since Irbis-E has enormeous power output, up to 20 kilowatts, it can detect an “standard” target (RCS at 3 square meters) 400 kilometers away. Normally, that figure is given for head-on aspect, in tail-on aspect it drops down to 150 km. Stealth targets (RCS at 0.01 square meters) can be detected at 90 km range. Irbis-E is also capable of target identification, and can conduct simultaneous air-to-air and air-to-ground operations. Su-35BM also has rearward radar system, to locate and track targets behind aircraft. Rear radar is located in tailcone. It’s still not known what system is going to use; Tikhomirov NIIP suggested it’s Osa type ESA radar for this task, but has also revealed it’s work on active-array radars that could fill this task, too. That information was given by NIIP to the public two years ago. The rear radar system is not something new for the Russian design bureaus; Su-35/T-10M features Phazotron N012 in the tailcone, MiG’s 1.42/1.44 MFI featured Phazotron N015, and the Su-34 Fullback features Leninets V005 tailcone radar system. As every Russian 4th gen fighter has optronic infrared search and track system, Su-35BM will naturally feature that too. OLS-35 can track four different IR signatures at once. Maximum detection range for tail-on aspect is 90 km, and for head-on 50 km. The laser rangefinder can measure distance up to 20 km against aerial targets, and up to 30 km against ground based targets. Electronic warfare system, the KNIRTI L175M Khibiny-M, is capable of accurate detection of the threats, threat coordinate mapping, and it’s also responsible for jamming signal generation and emmision replication/imitation, via wing-tip carried pods. The system has a separate display in the Su-35BM cockpit. The L175M, together with frontal and back radars and optronic complex is hooked up to “sensory fusion” package. Khibiny can also provide guidance for passive-radiation guided missiles, such as R-27EP and the new long-range type of AAM. Su-35BM also features approx. 150 aerials on it’s airframe. Apart from standard RWR (radar warning receiever), Su-35BM also has laser emission warning system, MAWS (missile approach warning system), and standard chaff / flare dispenser. Powerful computer system will control all those sensory elements, giving information to the pilot in unique interface; via the two large LCD MFD’s found in cockpit, and shown in pilot’s helmet mounted display as well. Cockpit is summarized in MAK-35 system; two 22.5×30 cm AMLCD’s, IKSh-1M widescreen HUD, and one back-up multifunctional display. The nav / attack functions are the responsibilty of KRNPO-35, and the plane is fitted with laser-gyro system, LINS-2000. Su-35BM, as an true multirole fighter, will have both air-to-air, air-to-ground, and anti-ship weaponry. Whole current pallete of A2G precision missiles and bombs will be supported on Su-35BM. Regarding air-to-air, the aircraft has an Archer, Alamo, and Adder family capability (R-73, R-27, R-77). Su-35BM will also be able to launch ultra-long range active radar missiles. The type of this weapon shown on the Su-35BM model was Novator KS-172S-1 AAM. The same missile has been presented on the displayed Su-35BM at MAKS 2007 airshow. The KS-172S-1 has an engagement range over 300 kilometers, can be used against any kind of aircraft flying from 3 meters altitude to 30 kilometers altitude, up to 4000 kilometers per hour of speed, and up to 12G. The only thing that’s confirmed is that Su-35BM will have ultralong range radar missile engagement capability; KS-172S-1 has not been asured. The other ULR AAM in Russian developement is Vympel K-37/R-37M. It’s an upgrade of MiG-31M’s R-37 missile, which has been sucessfully tested against targets 300 kilometers away. 3M14AE and 3M54AE are the missiles from “Kalibr” system, developed from naval “Club” system. The first is LACM, while the other is standard anti-ship missile. The unspecified anti-radar missile could turn up as new Raduga X-58UShE. It works in wide-band regime, and has a maximum range of 200 km. The sole-carried large ASM/AGM is suspected to be Yakhont-M, GRAU coded 3M55A. Yakhont-M is the upgraded export variant of P-800 Onyx missile. Original Onyx has the range of 300 km. Su-35BM is also fitted with standard 30mm gun of Flanker family; Gryazev-Shipunov GSh-301. Maximum of five carried. AAM. Maximum of twelve carried. AAM. Maximum of four carried. AAM. Maximum of eight carried. AAM. Maximum of six carried. AAM. Non-specified ultralong range air to ground missile Maximum of one carried. AGM. Non-specified long range air to ground missile Maximum of three carried. AGM. Non-specified long range anti-radar missile Maximum of five carried. AGM. Non-specified long range air to ship missile Maximum of five carried. ASM. Maximum of 5 carried, AGM/ASM. Maximum of 6 carried, AGM. Maximum of eight carried, smart bomb. Maximum of three carried, smart bomb. Maximum of six carried, guided rocket. 500kg class bomb Maximum of ten carried, gravity bomb. 250kg class bomb Maximum of thirty-two carried, gravity bomb. B-8M-1 Maximum of 120 carried in six dispensers, unguided rocket. B-13L Maximum of 30 carried in six dispensers, unguided rocket. S-250FM-PU Maximum of six carried, unguided rocket. Payload capacity from KnAAPO, weapon specs from various sources. I did not know something named SU-35BM even existed i researched and found this article extremely impressive machine i believe SU-30MKI is extremely inferiour to this Russian flanker i mean big differences but what really bothered me was the damn tracking range of this Irbis-E rader its like a damn awacs i suppose it will can detect an F-16's at extreme ranges which is going to be a very big advantge i am worried because i think india will get the Irbis-E rader as part of its SU-30MKI upgrade but nodoubt this SU-30BM machine is extremely impressive by all means. Titan_1984, thanks for the links, impressive stuff. It will be interesting to see how the Su-30MKI will face up to F-16C Block52+ or the souped up J-10s. I am no expert on flankers but this SU-35BM is said to have surpassed the SU-37 terminator as the article suggests its almost a new machine if you like you can even say its an improvemnt over the SU-37 ,reduced weight,extreme use of composites, will have the ability to supercruise, its rader is something which really scares me its a superve machine and yes the HMS seemed even weird to me. hmmm, seems like you are right..
glass cockpit is a nice feature for a russian plane...though the information displayed does not look very streamlines...as it is on many other fighters such as F16-blk60, EF2000, Rafale, Gripen, JF-17.......looking at these pics...the cockpit does not feel right...doent you think? i think its because they are using 2 large screens which accomodate all the date....where as rest of us use 3 screens with each displaying specific data.....i think the latter method is better...but thats just me may be? No doubt the cockpit looks great and looks completely digital as compared to the analog ones previously used by the Russians this is a very big improvement i must say Russians have improved their technology and are moving away from their old methods and concepts, doesnt matter if it 2 screens or 3 i suppose 2 big display screen suits them better so be it but i was impressed by the fact that the Russian Removed the canards and enlarged the control surfices on the wings of the SU-30BM this is one mean machine i was shocked by the fact that this plane will have the supercruise capability, they will bring its RCS down by using composites and RAM coatings that will bring its RCS down but due to big size it will be easy to detect it by an AESA rader but i was shocked by the Damn range of the Ibris E rader it can track F-16 size targets at the range of 400km thats a huge accomplishment on their part and the fact fighter size targets with an RCS of 0.01 can be detected at 90km very impressive this planes is something else altogather. Guys don't forget what ACM said in AFM interview. He said they are very mindful of the fact that powerful radars alone is not everything and given the sophistication of today's RWR, these radar will readily make the opponent aware of who is painting them with their radar. Even in today's air to air missions "sneaking" in on enemy is the holy grail of air combat. Noone keeps their radars open scaning the skies at all times. Even in interceptions they are kept turned off at most times. Just take the example of one interception done by a PAF viper pilot over Afghan border. He was vectored in by GCI and only when it was in the surprise zone did he turned on his radar and started engaing the hostiles.Also look at the limits of current BVR missiles and ask yourself, does it matter if i detect my enemy at 100 kms while he detected me at 110 kms? No pilot in their right mind will employ their BVR weapon at the edge of it's limits. No matter what the maximum ranges of these weapons, more important number in this whole equation is their max No Escape Zone range (NEZ). I can tell you that don't bother yourself too much with RCS figures of aircrafts which will have external stores. 1 m^2 or 3 m^2 in today's aircombat doesn't give you too much to play with, specially due to increasing radar ranges. Either you go the Raptor route and do the whole nine yards of stealth or work on your ECM/ESM packages to increase the survivability. What should we do in our case what your saying is good to hear bro but woudnt for example a flanker with Ibris E know where the F-16 is at since it would have detected it at such a long range and the PAF pilot would be a at a big disadvatage since the flanker would be very well aware of the Vipers position so how should one counter this plz enlighten me. True bro but i was talking about the Ibris E rader man it can track F-16 fighter size targets 400 km away whats the point of bringing in AWACS when the Damn rader has such a huge range yes your right our AWACS will see it(MKI) at the same time it spots the F-16 but this rader has a huge range that seems to be the troble and if i remember the Damn indians were going to put it in their upgraded MKI airframes thats whats worrying me thats all. Forget about SU35 or 37 or whatever, they are still on the paper, indians like to dream, they dream of everything. Su30mki has a powerful radar, but it lack the capability of "seperating" enemy from friends, you know what I mean? it see the targets but don't know which one is which one, and that is only for air-air mode, for air to ground it simply lack the capability. it is a heavy machine not suitable for air to air combat, but india airforce use it as a air superiority plane, which is understandable. like I said india is a poor country, and cant' afford to have seperate fighter and fighter/bombers. like US, Russia, China all have dedicated air superiority fighters along with ground attack fighters. that is why india choose Su30mki, unfortunally, Sukhoi design bureau didn't finish the job well, Su30mki is for the "market" not a mature product. it is good for countries like india to show off, but not good for practical use. Well u still havnt justified ur answer well!! Todays aircombat depends on matured BVR weapons and i dont know if russians missiles are as good as AMRAAM/Darter or Python series. n in close range it is still a very potent fighter just like USNs F-14s.Just imagine How big was the aircraft how much capable it was. And Su-30 is even smaller in size and wingspan. and yeah i doubt the capabilities and where as performance is concerned Su-30 is really an impressive fighter. Big difference. Is that load mainly fuel or weapons? We need to compare using enough fuel for similar range/endurance (which may differ per aircraft) and similar weapons load. France and India are discussing the integration of modular air-to-surface weapons on the Indian air force's Sukhoi Su-30MKI and MiG-29 fighter aircraft. Sagem Defense and Security, part of the Safran Group, is discussing an agreement with India covering the Armament Air-Sol-Modulaire (AASM) range of precision-guided weapons now in development for the French air force. A Sagem official says the company has been in talks with India for a "few months" concerning a possible AASM purchase. The French company already provides some avionics systems for India's Su-30MKIs. Were a deal to be struck, it would not be the first time for India to integrate a foreign weapon on its Su-30MKI. New Delhi has already selected a version of the Israeli Rafael Popeye medium-range air-to-surface missile. Indian interest in the AASM also underscores a gap in Russia's own weapons inventory, which has no comparable system. The Su-30MKI likely would carry six AASM weapons on two triple-store launchers. 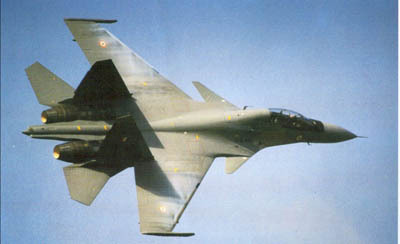 The MiG-29 would be fitted with 4-6 rounds. Russia would qualify the weapon, with the Ahktubinsk test center a candidate for firing trials. Several guidance options eventually will be available for the AASM including radar and imaging infrared seekers. All variants would use an inertial measurement unit coupled with GPS, with one low-cost version using only an IMU/GPS package. The French air force is slated to start taking delivery of the first batch of AASMs in late 2006 or early 2007. It has placed an initial order for 3,000. The AASM has a range of up to 50 km. using a high-altitude launch, with a fly-out range of 15 km. from a low-altitude release. Wing-kit and solid rocket motor range extension options are also in the pipeline. While the basic AASM kit is for a 500-lb. bomb, it could be comparatively easily modified for either 1,000- or 250-lb. munitions. Sagem also wants to sell avionics systems for Russian platforms. The air force presently prohibits its aircraft from being fitted with non-Russian-sourced systems. Sagem, however, is trying to see if there is an opportunity to provide some kit for Sukhoi's proposed Su-35BM development of the Flanker design. This would be a new-build aircraft offered for both the Russian air force and export. With long-term military budget cuts looming once again, the U.S. Air Force and Lockheed Martin are finally talking about some of the F/A-22 Raptor's closely held secrets that they hope will keep Congress paying for the $132-million stealth aircraft. While these conversations, many of them informal, didn't touch on "even one-third of its classified capabilities," according to one pilot, they included the ability to hunt down and destroy cruise missiles well behind enemy lines, the introduction of a new missile that allows the head-on attack and destruction of stealthy enemy missiles, a tailless bomber derivative design, a planned electronic attack capability so powerful that it actually damages enemy electronics, and modifications that would allow the aircraft's electronic package to invade enemy computer networks. The tone of the conversations was sharpened by a still-unreleased report about the series of air combat training engagements earlier this year between Indian air force Su-30MKs and F-15Cs from Elmendorf AFB, Alaska; the latter were equipped with the U.S.' newest long-range, high-definition radars. Those who have read draft copies of the report say the Su-30MKs and F-15 pilots were seeing each other at the same time with their radars, but the Indian pilots were getting off the simulated first shot with their AA-10 Alamo missiles and often winning the long-range engagements. The Indian pilots also had more flight time in the previous year than the U.S. pilots, roughly 300 hr. compared with 250 hr., the pilot said. Those factors are causing the U.S. to rethink the formula that they always will be facing less well-trained pilots and inferior weaponry. They also reinforce the argument that the U.S. needs a fighter with greater radar range (the F/A-22's is more than 100 naut. mi. ), stealth (the F-15 has a huge radar cross section) and fused sensors so that pilots can easily grasp what's going on around them. Key to the F/A-22's capabilities is a complex of passive sensors, basically for electronic surveillance, that line the outside edges of the fighter's wings and tail surfaces. They gather electronic emissions at frequencies up to 18 GHz., sort them by time and angle of arrival for location, and analyze the signature automatically for rapid identification. Electronic data are fused with detailed RCS signatures gathered by the radar for additional identification. HOW MANY F/A-22S the Air Force eventually gets is still a crap shoot. Estimates range from a service requirement for more than 400 to pessimistic predictions of only 100-150 if the congressional budgeters, soured by the growing cost of the wars in Iraq and Afghanistan, are unsympathetic. A primary mission for the F/A-22 is slated to be cruise missile interception well behind enemy lines. "A cruise missile has stealth in only one direction--straight ahead," says Lt. Col. Mike Stapleton, operations officer for the 43rd Fighter Sqdn. The F-22s would operate in an extended picket line so they can look at cruise missiles to either side of their patrol area from a beam aspect where the missile is not low-observable. In addition, the new, 200-naut.-mi. AESA radar, in development for the E-10 surveillance aircraft, is to provide key cueing of cruise missile locations. Tactics used by cruise missile operators are instructive. One option is to send waves of 10 missiles that would pull defenses to one side while a following wave slips through. Another is to disperse a large launch into many directions so that some actually approach the targets from behind. Those tactics have led the U.S. to plan a multi-layered defense that begins with F-22s deep in enemy territory. While F-22s would normally operate at the 45,000-50,000-ft. level, for cruise missile defense they would drop into the middle altitudes around 25,000-30,000 ft. That would allow them the flexibility to combat both AS-4 "Kitchen" or CAS-1 "Kraken"-type, high-speed, air-launched missiles (predictable course, but little time to react) or to pick "Silkworm"-type missiles (low speed, but unpredictable course) out of ground clutter. Detailed information on missiles that leaked through the F/A-22 line would be sent by data link to second and third defensive layers comprising AESA-radar-equipped F-15s and F/A-18Es operating in less well-defended areas. Four of the initial seven cadre pilots in the 43nd Fighter Sqdn., the Air Force's first F/A-22 squadron, came from the AESA-equipped F-15 squadrons in Alaska, where they developed concepts for airborne cruise missile defense, Stapleton says. While F/A-22 crews will train to attack cruise missiles with AIM-9s and 20-mm. cannon, the primary weapon will be the AIM-120C Amraam. A variant, the AIM-120C-6 (available by 2006), has been specialized with an improved seeker to optimize the explosive cone of destruction for small, slow targets in a head-on engagement with the F/A-22. The upgraded Amraam incorporates improved fuzing through a new quadrant target-detection device. One tactic for the F-22s will be to approach a wave of cruise missiles head-on, get in a first shot and then turn at Mach 1.7 supercruise speed for a second and third shot from behind. F/A-22S ASSIGNED the cruise missile defense mission would carry at least six Amraams and possibly more when a compressed-carriage AIM-120 design is fielded, says J.R. McDonald, director of Lockheed Martin's F/A-22 program. The range of the F/A-22 can be extended with two 600-gal., low-observable fuel tanks carried on two inboard hard points that are plumbed to transfer fuel. However, there are a number of concepts for a larger, longer range FB-22 that could also carry a larger weapons payload. McDonald says the weapons bay on either the F/A-22 or FB-22 concepts could be enlarged to carry more missiles. Moreover, because of the improvements in stealth coatings, shaping and RCS predictability, the changes could be made while actually improving the signature of the aircraft, he says. Some of the FB-22 derivative concepts being proposed by Lockheed Martin include both one- and two-seat options, with and without a vertical tail, McDonald said. The tailless version would be possible because the wing would be expanded and made large enough to carry sufficient flight control surfaces to provide adequate aerodynamic authority. "We have a smorgasbord of options," McDonald said. The objective is to preserve all the attributes of the F/A-22--stealth, speed, integrated avionics--while giving up a bit of agility in order to field a stable bombing platform. The aircraft would also be designed to control a wide range of unmanned reconnaissance and strike aircraft. Most intriguing about the F/A-22's future were hints from various sources that the fighter would have drastically improved electronic attack capability and would introduce computer network attack to its arsenal. Critics say some of the planning borders on the fanciful. Officials have acknowledged that the F/A-22's AESA radar has a projected capability to concentrate its transmission power onto a narrow spot--most likely the electronic radars and communication links associated with air defenses--with enough focus to jam them. The Thor jamming system is to be active in 2008. Those working on improvements say that with the addition of radar cheek arrays to the aircraft in 2010, it would be able to focus enough energy in a beam to actually damage electronic components in enemy sensors. SU30 MKI is the best fighter in the sub continent bar none. The induction of the mighty flanker is a question that PAF is stil looking to answer. May be the J10 OR even Rafael but lets wait and see. Wake up indians, Su30mki is not the best aircraft in where where, is was designed for ground attack, got it? don't let me repeat it. remember doesn't matter how many Su30mki india have, China is always there, we have whatever need to shoot those things down. we 400 Su27/J11/Su30 so far, J10 as many as we like, so you can't use those money eating machine again Pakistan. it will drain your countries' budget, and will not give you any security. cause we always have the better ones, we make them for ourself and for our friend Pak. and India have to beg Russians to get those junk. dream about your LCA, JF-17 are there and waiting for you. if you ever dare to attack Pakistan, then your slow moving SU30mki will face really killer from China and Pak. You guys just spending mouth water here and dream, but that is good, keep dreaming, by the year 2050 you will get your 230 su30mki. I was going to stay out of this worthless thread but this post got my attention. All your "top notch" weapons either are Russian, or have massive Russian/ Israeli input. Also, correct your figures on the Sukhoi/ Su copies that China has. 96 J-11s, 100 Su-30MKs, and 76 Su-27s only add upto 272 and not 400. As you already known, India use SU30MKI as air superiority aircraft, since it doesn’t has the air to ground capabilities, it can load the weapon which India government have shown you, but it couldn’t find the target. What a waste of bandwidth and time. Please stop smoking the "divine wind". Thats a very generic scenario. With any aircraft radar you have max values for scan in -ve, +ve azimuth and elevation. No one just cranks up their radar and starts blasting radio waves everywhere in search of adversaries. In today's world if you emit you get detected, simple as this.Whenever some tries to paint an aircraft it's RWR will tell it that it's being painted. Then given the dense ground based/aerial detection infrastructures around border areas on both sides it will be hard to sneak in undetected for anyone. That leaves you with the second tier tactics. 2)use of terrain particularly in Northern areas around Kashmir .Both sides will have lots of problems with Over The Horizon detections. 3)in the plains , you can always try and eat lot of dust (fly low ). 4)Jamming. Noone will send their aircraft without top cover and proper jamming assets. So it's basically admitting it's very hard to go undetected so lets Jam and try to "confuse" the enemy while friendlies are busy in strike. These are the tactics that will be relied upon. Strikes planes will again try to sneak in low in stealth modes (terrain mapping) or fly high make a quick entry and release autonomous BVR strike munition like Ra'Ad. dizasta is an indian guy. don't let that 400 km figure fool you. That's what they are advertising, but they are not going to get there. At least that's what China found out. In all honesty, Russians and their claims are far more extravagant then the capability of their fighters. Probably the reason why there is alot of skepticism within the Chinese ranks on the Flanker's capability. May also be one more reason why they are striving toward their own avionics, engines and missile developments. To make a claim is one thing, to prove it, is another. If the BARS radar is as good as they say it is, then why didn't they use it in the excersizes against the Brits and their Typhoons? The lame excuse of it being a compromising security risk, just doesn't cut it. No doubt, that the Flankers are a potent fighter force and that they do pose a formidable challenge to the western fighters. However, it is suffice to say, that there is alot more to the Flankers capabilitywhich is to be desired of its capability. The Su-35 Flanker, seems to be a ultra-refinement, maturity in design and technology advances. It remains to be seen, how it would be able to pit its capabilities with the likes of Typhoons, Rafales, Gripens, Vipers and Eagles. The Su-30Mki is indeed a good opponent and there is no doubt in my mind that the indian air force would have made every possibility available to them, to make the fighter justify for its 'loud' claims. The Chinese seem to have a very formidable Flanker force, larger than the indians. They are definately making headway in its development and its capability enhancements. With developments in engines for the J-11s, probably Chinese avionics and missiles, there is alot of potential for this fighter to pose as a force to be reckoned with, in future conflicts. On comparision, I believe that both versions of the Flanker, are very capable of giving their adversaries a run for their money. However, it remains to be seen, whether there would be actually successful against their western rival fighters. Su30mki has a powerful radar, but it lack the capability of "seperating" enemy from friends, you know what I mean? it see the targets but don't know which one is which one, and that is only for air-air mode, for air to ground it simply lack the capability. now members here who really think that they are some kind of Analyst, should decide wether to belive this non sense rant by this guy or not....what kind of post is this?? ?how you know so many weak points of MKI?? ?are you flying MKI these days or what??? why u dont think atleast one time before posting??? when china had this fighter.....??? strange!!! china su 30 and indian su 30 have many diffrences, this must be one thing you should have known by now . i have never heard paf having exercise with chinese air force. the imp thing n you need to know is that you canot take your f 16 to china bec of american guidelines atleast openly to do exercise with them .